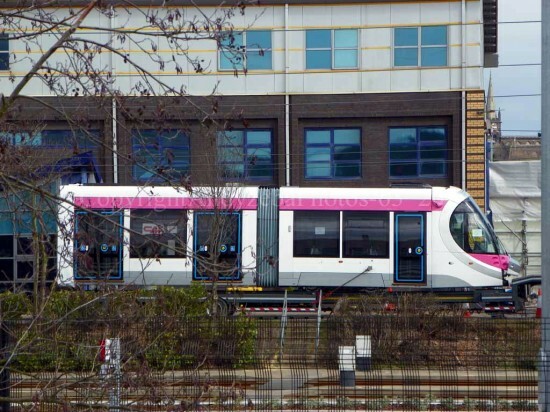 The fifth of the CAF constructed Urbos 3 trams for Midland Metro arrived at Wednesbury Depot on Monday 10th March. 21 followed the usual road, sea, road path via Santander and Plymouth from the CAF factory at Zaragoza in Spain and was again delivered in two sections. 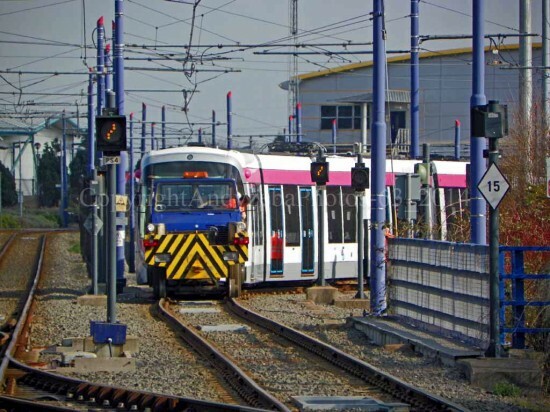 The tram arrived in Birmingham at approximately 1000 and was swiftly unloaded and both sections were connected together before Midland Metro’s Unimog was used to shunt the vehicle into the workshops for initial commissioning work to take place. The other four trams delivered so far remain stabled in the depot yard with initial testing having already taken place. No dates have yet been revealed as to when they will enter passenger service. One section of 21 after it had arrived at Wednesbury during the morning of 10th March 2014.
i have heard 1st of june as early start date. Has tram 4 now been withdrawn then ? Presume tram 5 wont be too far of joining them .